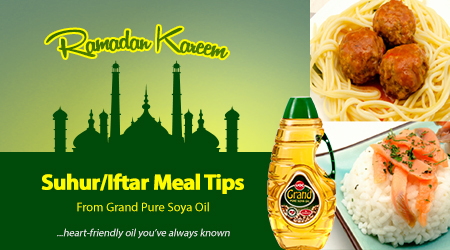 As we wind down the Ramadan month, Grand Pure Soya Oil, the heart friendly oil you have always known provides unique recipes for both Suhoor and Iftar. The most important consideration for Suhoor is that the food is a ‘fuller for longer’ recipe. Protein and fibre are very important for keeping hunger at bay. Here are 5 recipes packed with both great foods. Also, most of these meals can be prepared the night before. · Pre cooked chicken breasts finely sliced. 1. In a pot, heat your heart friendly GRAND PURE SOYA OIL and fry the onions over medium heat until tender. 3. When the mix begins to boil, reduce heat and simmer for 60 minutes with lid on. 4. Add in the rice and check if you need to add more water. Add seasoning Leave to simmer for half an hour or so. Note. You can make this in a slow cooker before going to bed. When it is time for Suhoor, just serve and enjoy.